Alum Chuck Kerr (B.A. 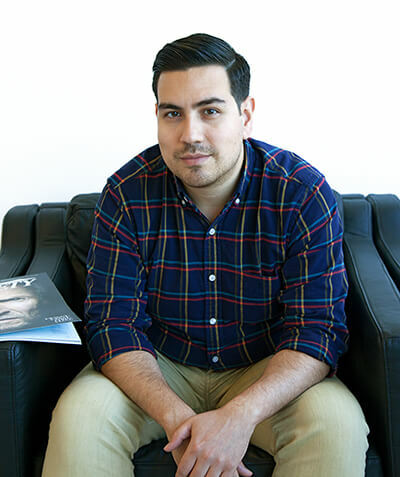 ’07) has landed a job as art director of Variety magazine – a holy grail for any graphic designer, and a big jump from his previous role as the San Antonio Current’s art director when we last talked to him in the Fall 2012 issue. Gold & Blue caught up Kerr in Los Angeles to learn about his new pursuit. Q: In a nutshell, what does your job as art director of the weekly magazine look like? to work with nationally renowned photographers and illustrators. For such a big undertaking (our issues can be up to 150 pages), the process is usually very smooth. Variety’s editorial staff pretty much invented the business of entertainment journalism, and they know how to get things done. Q: The scale and budget of Variety, not to mention its more than 100-year history, is impressive. What are your most exciting challenges? A: When I got the call to join up, I was excited, but also nervous since it seemed like such a huge leap. But a lot of the creative process is not too different from when I designed the San Antonio Current, or even when I was entertainment editor at The Rattler. tell the story. Only now, the story might be about the Oscars, media mega-mergers, or the state of the box office in China. If anything, the biggest challenge has been getting used to living (and driving) in Los Angeles. Q: I imagine you get to meet some interesting characters. Anything you can share? Q: What does the future look like for Variety, and what’s your role in that change? A: As the print industry changes we are constantly adapting to stay relevant, and we now focus solely on the weekly magazine and variety.com. My role in this new era is to help elevate the print edition’s design and visual storytelling to give readers a more engaging experience each week. While the website can break news better than a weekly magazine, print still has the web beat in terms of being a beautiful object that you can go back to again and again. You can’t frame a webpage, but you can still frame a Variety cover.